Welcome to West Monroe Self Storage, your source for quality storage units in Monroe, West Monroe, and all of Ouachita Parish. When it comes to providing self storage rooms with customer service that you can count on, we go above and beyond to provide the best storage solutions in town! Our West Monroe mini storage facility has many features to make your experience with us here both easy and efficient – 24/7 access, all ground-level storage units, and a whole lot more. When you store your things here in our West Monroe storage units, we provide the security to ensure the safekeeping of all your items. Offering enhanced security features such as recorded video surveillance, electronic building code access, and tenant insurance available, your things will always be in good hands with us here at West Monroe Self Storage. Rest your mind and take a load off when you store with us here – you deserve it! 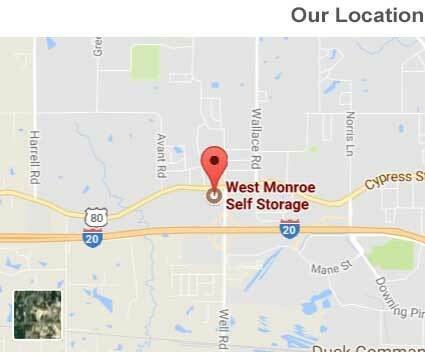 Our West Monroe mini storage facility is conveniently located on Cypress St, right off of I-20. We are easily accessible from all surrounding areas and ready to serve local residents and businesses with self storage solutions! For your convenience, we offer 24/7 self storage unit rental and move-in. We are happy to have you and look forward to storing with you! Contact us for storage solutions in West Monroe, LA 71291.